Latest In Beauty have come up with yet another Beauty Box Collaboration (They did Beauty and the Beast last month here) and this time it is the Harper's Bazaar Beauty Box. 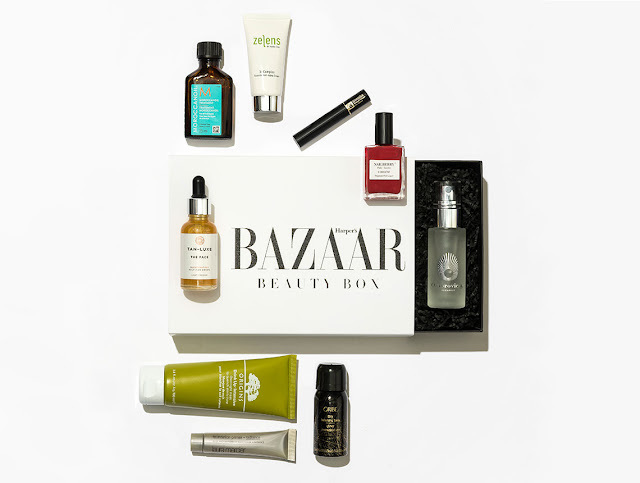 Featuring high-end beauty brands from the likes of Lancome, Ormorovicza and Laura Mercier, the Harper's Bazaar Beauty Box is all our beauty dreams come true. Laura Mercier Foundation Primer - Radiance. This lightweight gel primer has a subtle pearl tint, giving skin a soft-focus finish and minimizing the look of imperfections (#nofilter). Enriched with Vitamins A, C and E, Radiance Primer also protects skin from harmful environmental effects. Apply prior to your foundation to keep makeup looking fresh and colour-true all day. Nailberry L'Oxygene Oxygenated Nail Lacquer - Ever feel like you need to give your nails a break from nail polish so they can breathe a little? Well, now you don’t have to. Nailberry’s innovative, breathable Lacquers contain a breakthrough formulation that allows air and moisture to pass through the polish, keeping your nails in tip-top shape - result! Shades May Vary. Origins Drink Up Intensive Overnight Mask - Put dry skin to bed with this super-rich, hydrating overnight mask. Infused with botanical oils and Japanese Seaweed, the hard-working formula restores moisture and repairs the skin’s natural barrier overnight, whilst you get those all-important zzz’s. Lancome Hypnose Mascara - Turn up the volume of your lashes with Lancôme’s Hypnôse Mascara. The PowerFull™ Brush gives you full control, and adds thickness without clumping. Smudge-proof, and ultra-light, this bestseller ensures even application every time for truly Hypnôtising lashes. Tan Luxe The Face Illuminating Drops (Shade Light/Medium) - Avoid committing any (regrettable) fake-tan faux pas with Tan-Luxe’s tailor-made approach to tanning. Mix a few drops of THE FACE with your regular moisturiser to create your own bespoke self-tan. No streaks. No smells. No you’ve-been-tangoed moments. Morocconoil Treatment - For silky, shiny, swishy hair (the coveted triple S of hair goals), Moroccanoil Treatment is your new haircare BFF. First spotted backstage at the fashion shows, this brilliant lightweight oil guarantees shine, softness and control for your hair, even on the most rebellious of locks. Oribe Dry Texturising Spray - For perfectly tousled, I-just-woke-up-like-this hair (yeah, right), look no further than Oribe’s bestselling styling spray. Half dry shampoo, half texturizing spray, 100% full-on glamourous volume, bed-head hair never looked so chic. Zelens 3T Complex Essential Anti-Ageing Cream - Dr. Lens’ Triterpenoid Regenerative (“3t” for short) Complex works to dramatically firm and smooth the appearance of skin, reducing lines and wrinkles, and restoring plumpness. Enriched with 15 botanical extracts, 5 marine algae, and 7 herbal oils, this super-charged cream is the miracle we’ve been wishing for. I love the mixture of brands and products within this box. There are a few of my favourite products such as Origins Drink Up Overnight Intensive Mask and The Queen of Hungry Mist by Omorovicza which are incredible, plus there are a few products I have wanted to try for a while which include the Laura Mercier Foundation Primer. This box is worth an incredible £156 but available for just £45 here. Are you impressed by the box? Any stand out products? This is a fantastic line up of products, it has just reminded me how much I love the Origins Drink Up Intensive Overnight Mask too. The mist is one of my fave products ever!!! This is great, I'd rather pay more for a box and get a better selection of products! I love Laura mercier but haven't tried the primer. Wow now this box is good and so many brands i desperately want to try and love. That is such a good box! Love the mix of brands!